Can you believe it’s already fall? It feels like summer flew by but before you know it we’ll be preparing for Halloween! There are tons of fun events going on this month, and we’ve found some of the best ones taking place across the Bay State! Grab your friends and family and head to these fun events this October! Harpoon Octoberfest – This fall tradition is taking place on Friday, October 4th from 5:30 PM – 11 PM (doors close at 9 PM) and Saturday, October 5th from 2 PM – 9 PM (doors close at 7:30 PM) at the Harpoon Brewery in Boston. This event is 21+ and tickets are not available in advance, you must pay the $20 cover at the door which includes admission, a drink ticket, and a souvenir Pint cup, also keep in mind that this event is cash only. There won’t be parking at the brewery but there will be a shuttle bus at South Station running to and from the event. Come enjoy German food, live music, German chocolate cake eating contests, keg bowling, and of course tons of fresh Harpoon beer options including IPA, Octoberfest, and UFO Pumpkin. 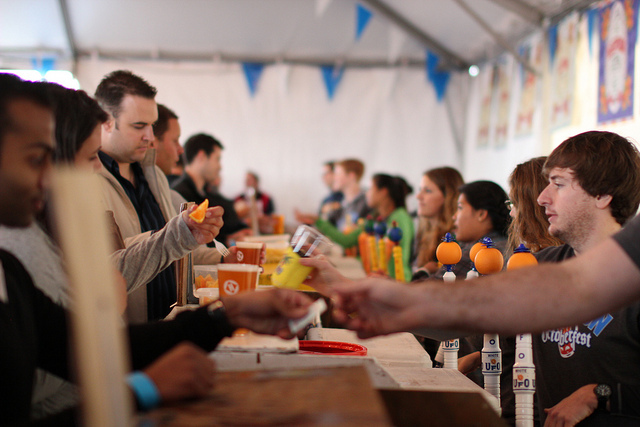 Unwind with friends after the workweek and celebrate the start of fall at Octoberfest! Riverside Blues and BBQ Festival – Hosted by the Franklin County Rotary Club and the Greenfield Recreation Department, this family friendly event is taking place at Beacon Field in Greenfield from Friday, October 11th – Sunday, October 13th. There will be professional BBQ competitors from across New England competing in grilling contests, and two days of Blues music, beer sampling, crafters, vendors, and activities for the kids. On Friday night there will be a free outdoor movie night at 7 PM with free admission and popcorn to kick off the festival. On Saturday and Sunday, events will be from 12 noon – 6 PM, admission to the festival is $5, and children ages 10 and under are free with a paying adult. Admission to the BBQ Samplin’ Pit is $5 and guests can sample and vote for their favorite teams. On Saturday guests can sample chicken wings and on Sunday there will be pulled pork. Admission to the BrewFest Beer Samplin’ Saloon is $20 from 1:00 PM – 5:00 PM, and includes as many beer samples as you can drink. Newburyport’s Great Pumpkin Lighting and Stroll – This family friendly event is taking place on Saturday, October 19th from 6 PM – 9 PM at Market Square in Newburyport. Families are encouraged to bring a carved pumpkin that will be lit and placed on the stage in Market Square. Every family will be provided with a votive candle that will be lit all together at dusk, approximately 6:15 PM, and placed in the pumpkins which will be put on stage. Families are then invited to stroll through beautiful downtown Newburyport, along the water, and to admire the pumpkins designed by local businesses. At the end of the night, families are asked to take their pumpkins home for safe keeping. This is a great way to get in the Halloween spirit with the whole family! 30th Annual Applefest – Head to Wachusett Mountain in Princeton on October 19th – 20th for Applefest! This event is perfect for the whole family, and fun for all ages. There will be live music, a mountainside barbecue, pie eating contests, Skyrides to the scenic Summit, craft & farmer’s market booths, and clowns, jugglers, magicians, pony & hay rides, and a climbing wall for the kids. There will also be an Oktoberfest Celebration featuring authentic German cuisine, a variety of beers in the Beer Garden, and live entertainment. This event is from 10 AM – 5 PM both days and tickets are $12 for adults at the door and $7 for children ages 6 – 12. Discounts are available if you purchase in advance online and there are also packages available that include admission, food vouchers, play activities and more! If you weren’t in the fall spirit before, you will be after these events! Furry Friend Friday With Woodrow!